Rubles come in various colours and degrees of authenticity. Currently there are large green 5's, olive-green 10's, blue 50's, red-brown 100's, pinkish 500's, light green 1000's and red 5000-ruble notes. 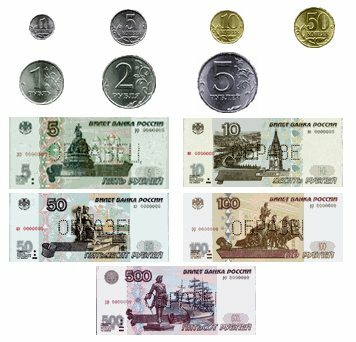 Also, there are coins of one, five, 10, and 50 kopecks (100 kopecks are equal to 1 ruble). Exchange offices abound, particularly in the city centre and around tourist areas. Rates at different currency exchange booths vary somewhat, usually within a fifty-kopeck range, so unless you plan on exchanging thousands there's little point in running around looking for the best rate, though after-hours and weekend exchanges tend to offer lower rates. Whenever you hand hard currency over to someone, it is quite common for the bills to be checked for authenticity individually by a variety of techniques. Don't take this as an insult as counterfeit money has proliferated in the country over the last couple of years. Torn, well-worn, heavily written on, or faded currency gets turned down in almost all cases. Exchange booths are very often located in shops selling pricier items (electronics, fashion clothes, cars) as well as casinos (good for late-night money changing) and hotels. Both banks and exchange booths will change most major currencies into rubles at the posted rates of exchange and almost all banks will change major travellers cheques. Many give cash advances on credit cards. Fees and commissions are often posted at the exchange window. There is a 0.5% tax on all currency exchanges. In order to exchange money you are supposed to present your passport (a photocopy will do) or some other form of identification, although having nothing to show is not usually a problem. You will be given a slip recording the transaction which you should keep with your customs declaration just in case some customs officer decides to actually check how much money you are taking out.